Applications can exist independently of leads, but you'll want to make sure you connect your applications with your leads as soon as possible. Here's how applications can be started and how you can connect them with your leads—whether to an already-existing lead, or by using the application information to create a new lead. Leads can start an application by going to your online application form. The application's settings will determine whether and how leads will be able to interact with the form. 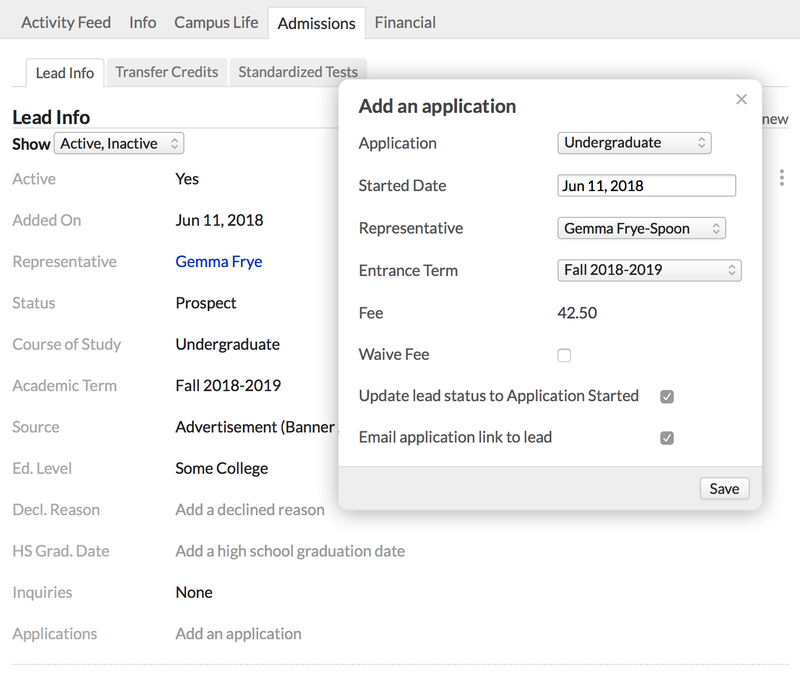 Using the application's embed code, you can embed the initial form in any page on your school's website (ideally paired with custom CSS that gives the form the same appearance as the rest of the page). You can also start applications for leads on their Profiles. Go to the lead's Profile > Admissions view. At the bottom of the active Lead Info set, click Add an application. Select an application, fill out the rest of the details, and Save. Here's how to link an application to a lead—whether to an existing lead or a brand-new person you'll add based on information from the application. Go to Admissions > Applications. Look for applications marked with . Those applications are not linked to a specific lead. You can also use the filter to find applications that are not linked to a person. Click the name to go to the application page. Possible match: If Populi matches the application to an existing person in your database, you'll see them listed here. Matches are based on some combination of name and contact information. Click a suggested name to go to that person's profile. If it's a good match, click the radio button and then Apply. Add as a new person: Click the radio button and then Apply to create a new person based on the application info. Link to an existing person: If there are no matches, but you know this person is already in Populi (say, she's entered under her maiden name but she inquired after getting married), click the radio button and then search for existing people. Once you've found the match, click the name and then Apply. 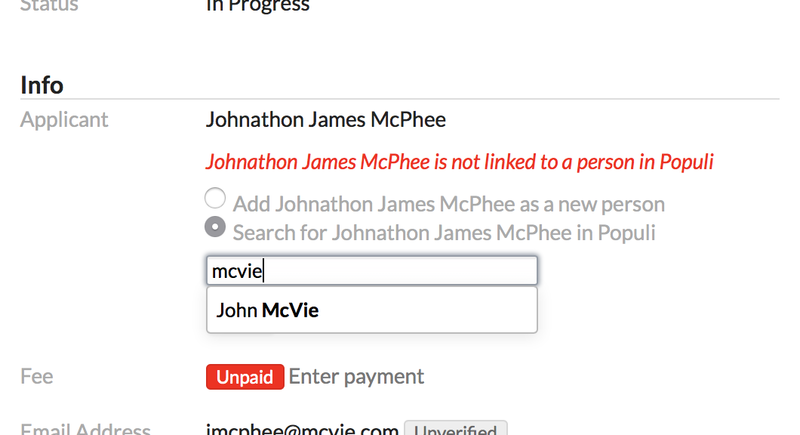 The name from the application will be replaced by the name of the person to whom you linked it; all other information will be added to anything that already exists. Now that you've created or added the application and linked it to a Lead, you're ready to work on processing the application.